After missing couple of weeks BearyBox sketch challenges, I sure am glad that I'm able to join in the rest of the Design Team this week. And make sure to join the rest of the Design Team for this weeks challenge and BearyBox would like to give this week's winner a goodies bag consist of 7gypsies, American Crafts and Creative Imagination products! I was trying to put it together, it just came out completely different. 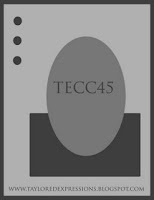 Still debating if I was happy with it but just didn't have enough time to create another card to be submitted. 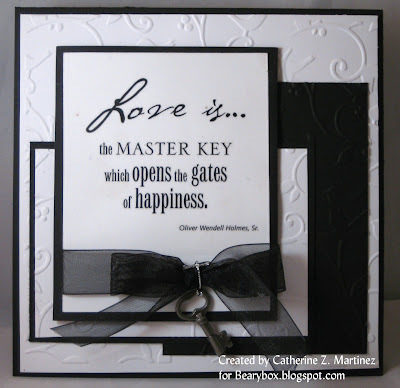 The sentiment is a clear sticker by Cloud 9 Design adhered to a Whisper White card stock and matted with Basic Black card stock with Back sheer ribbon and what a perfect way to finished it with a key charm. Two cards in one day?!? Well, the first one was supposed to be posted yesterday but I was having issues posting it while I was home and I thought I emailed the file to work but it didn't go through. Anyway, I really don't do well with color challenges and it's been awhile since the last time I join the Loonie bunch team...LOL! So, when I saw their color challenge last week and tried several attempt, I literally gave up but tried it again when I saw Ashley's card :). But, I still able to messed up on this challenge because they're asking for a Birthday theme...oh well, I tried! The flowers are from Flower Garden set from PTI. I thought I had some brown crystal beads to make the center of the flowers popped and I think the card will look prettier but I had to settle with what I have...pink crystal beads. 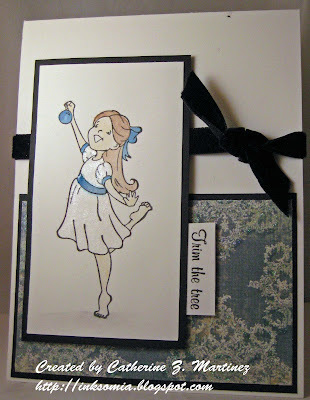 The second card is for Amy of Prairie Paper and Ink, Friday Sketch Challenge. This Mouse Under the Hat is from Whiff of Joy. I grab the colors from the patterned paper that I used on this card. 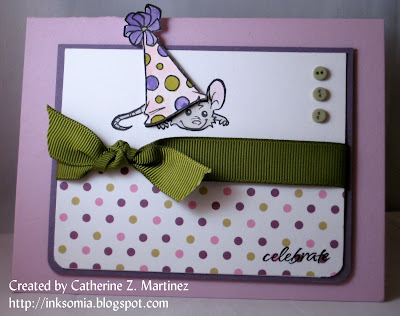 The mouse was stamped on whisper white card stock, stamped again, cut and raised with stamping dimensional. Happy Monday! No, I wasn't able to stamp my heart away this weekend but I was able to join this weeks Taylor's Cupcake Challenge. And I just have to use this adorable stamp from Whiff of Joy, Henry Celebrating Mouse. The image was stamped on Whisper White card stock, colored with Stampin' Up re-inkers, the cupcake was stamp again, cut and raised with stamping dimensional. 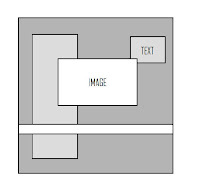 The main image was layered with Close to Cocoa card stock using Nestabilities labels. Oh, am I so glad to be able to stamp again! 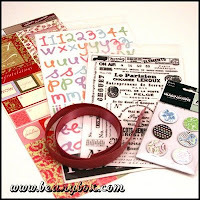 I've missed my stamps, card stocks, inks and oh, those ribbons... LOL! Anyway, thanks for the warm welcome and warm wishes, I sure do appreciate you all. The main image is from Stampavie, Lelo Design You Go First. I purchased some of the Lelo Design after the holidays as a Christmas gift for myself and I've been dying to use them. They are just adorable and I think these two are just purr-fect for Valentines Day. 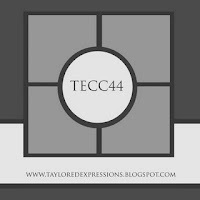 Anyway, while browsing thru blogs and getting my mojo back into action, I saw Monica's sketch challenge last week for Taylor's Cupcake Challenge. A little late for all 8 sketch challenges but I sure would love to join in the fun. I used my new Scallop Circle Nestabilities that I got this Christmas from my sister (thanks, Pen!) for the base of the card. 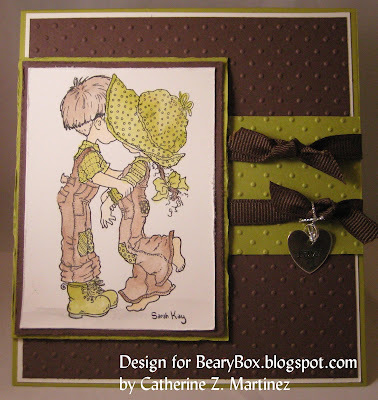 The heart is a chipboard and sponged using Red Riding Hood classic ink and sentiment is a Stampin' Up rub-on. I want to thank everyone who emailed me asking "WHERE HAVE I BEEN?" Now, to answer that. I did plan for a week off blogging before Christmas but things just got bad. Remember the saying "when it rain, it pours"? (Ashley Newell posted that on her blog a couple of months ago but hers was just all good things coming her way...LOL!) Anyway, my home computer decided to quit on me, lost my digital camera (found it btw, in between the pillows of my sisters' couch...phew!) and been suffering with back pain, which prevents me from sitting for a long time. But, I'm back and ready to CREATE! Nothing to share today but just wanted to let you know that I'm back. And again, thanks for all your concerns and I apologize for not responding. There really is Santa, Mom! We didn't get home until 8:45 last night. I had to work overtime, it takes about 45 minutes to drive home, pick up T and by the time I was able to get her, it was too late to make dinner. So we went to In & Out burger for a quick bite and headed home. A box from Amazon.com was waiting for us in front of our house last night and T asked what I ordered and told her nothing. The package was addressed to her, she was so excited and tried to rip open the box and you should see the smile on her face while she's opening it. Oh, btw, she keeps shaking the box before she opened it and kept asking me, who would send her a package? 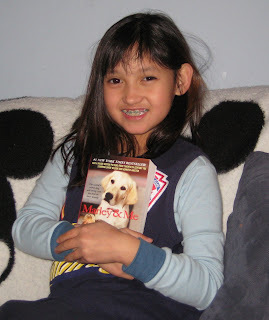 She found 2 Marley and Me books inside. T: Oh my gosh, Mom! LOOK! M: WOW! Who would send you those books? T: You didn't order it for me? You haven't mailed my Santa letter and he already sent me his presents. M: You should write him a letter and thank him. When I posted my M&T conversation here, I never intended to have anyone send her anything but Chris of Chris Scrappin and Stampin in Texas left me a comment and asked for my address. Before I can email her and let her know that she didn't have to do that, she found my address already on SCS and placed an order at Amazon.com. Chris, THANK YOU so much for doing this. You just didn't make her day, you made mine also. Thank you, Santa Chris! No cards for you today but just to let you know that Denise is offering a 20% discount* of your entire Whimsy Stamps starting today, Friday, December 19th until Sunday, December 21st. Enter promo code HOLIDAY to receive your discount. *discount will be deducted prior to applying shipping and handling charges. I don't think I followed the sketch this week, but for sure I wanted to use my new Sarah Kay stamps by Stampavie and there's no way it can fit so I had to rotate the sketch and tried to keep it as close to the sketch as possible. I used the same color combination from my last card, I had these card stocks on my craft table laying around and I really like it so why not use it one more time. 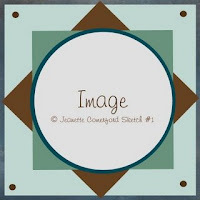 Visit us here to see the details for this weeks sketch challenge. Just need to wrapped all the presents and I'm done! Well, all the gifts for friends and family are done but not for my Toni. She's 8 years-old and I think she starting to know that Santa is Mom but really don't want to believe that knowing that she won't receive anything from him...LOL! 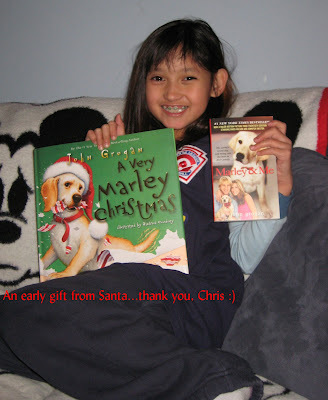 This weekend, I asked her if she can make a letter for Santa (I think hearing from me saying that I don't have extra money for a lot of gifts this year) she wants Santa to give her a Marley and Me book (I wanted to cry when she said that) but, then she started adding stuff on her Santa list...LOL! Anyway, I haven't been creating lately, been stressed and tired of the house hunting and by the time I get home, I just want to go to bed. I actually made this card sometime last week, when Dawns a.k.a. FlowerGal36 was the Featured Stamper on SCS. This is the card I CASE'd, I really like the colors that she used, so I kept everything the same and just change the image. The main image is from Whipper Snapper, Lovely Christmas Presents. No cards today! But just wanted to stop by and post the Whimsy Stamp Winner. Random.Toni picked #15 and that you...Manna! Cute card, Catherine! I have missed a dose of you for a few days :) You are a great inspiration! Have a great day everyone and hope to see you tomorrow! Denise owner of Whimsy Stamps emailed us early this week and letting us know that Whimsy Stamps will be sponsoring this weeks challenge at Stamp Something. It's a color challenge using Red, Green and Gold. She was nice to mention that she would love the rest of the Design Team members to participate but it's ok if we're unable too. The first thing I said... I'll pass, I just have a hard time with color challenges but being a good DT, I thought I would play along. 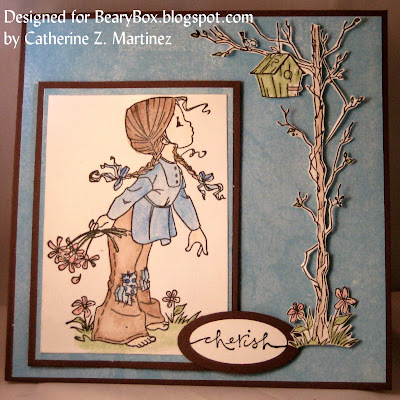 So, after dinner and homework last night, I blog hop and look for a cool sketch to use with the color challenge and found out that Frances of Stamp Owl's Studio is hosting this weeks MFT sketch challenge. 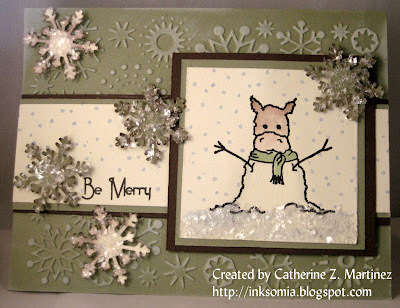 So, I combine both MFT sketch challenge and Stamp Something color challenge and I got Toni's Christmas card done. Toni thinks that Oscar (she named my new Whimsy stamps Owl - Oscar De La Hoya after seeing the boxing match over the weekend...LOL!) 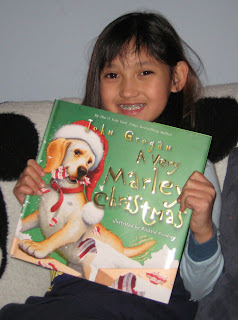 is just adorable, and I know that she'll get a kick out of it knowing that I used him for her Christmas card. And if you think that there's too much details on this card....for her, the more details, the more she thinks that mom can really make cards. Want to win some Whimsy Stamps? Make sure to check out this post and check out Stamp Something. It's time for another BearyBox Sketch Challenge and boy oh boy, did I have a hard time with this one...LOL! Anyway, join us this week for this challenge and you'll get a chance to win a set of 4pc Tsukineko: Brilliance Dew Drop Basic set. And when I found out last week that BearyBox will be carrying Sarah Kay Collection II, starting today, I thought why not use my Sarah Kay Rose's Garden for this weeks sketch challenge. Image was stamped on Whisper White card stock and colored with Stampin' Up re-inkers. I cut the image out with my Oval Coluzzle template and cut Chocolate Chip cardstock with the next bigger Coluzzle oval, I added the scallops with the corner rounder punch. The patterned paper is from My Mind's Eye pack that I purchased from Costco last year. 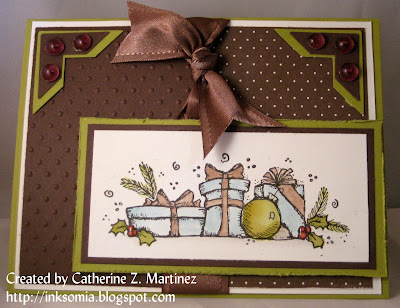 The sentiment is from Papertrey Ink's Green Thumb, finished the card with Chocolate Chip gross grain ribbon. 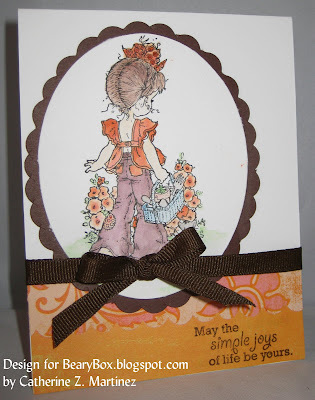 The layout is from this week's Featured Stamper at SCS, Annascreations. Here's the card that I choose to CASE. Sophia was stamped on Whisper White card stock, her dress was colored using white shimmer paints and SU Pacific Point re-inkers. The patterned paper is from My Mind's Eye Christmas Glitter Collection. 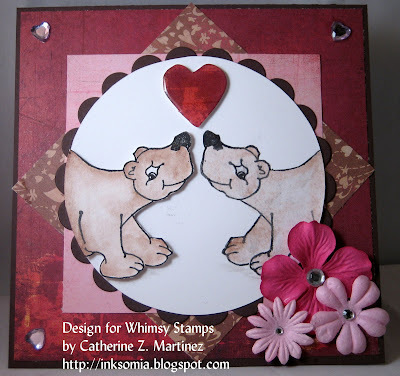 Make sure to check out this post to win some Whimsy Stamps. You have until, Sunday, December 14th, 6PM EST. A day late for Taylor's sketch challenge but I just love this sketch. I can do sketch challenges but when it comes to color combination, I have the hardest time with it. So, just like what I always do with most of my cards, I would pick the best image for the sketch, grab some pattered paper and use that as an inspiration. 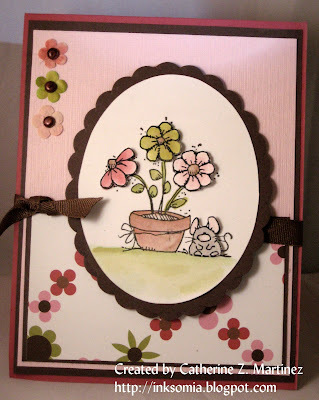 Main image is from Whipper Snapper Design, Flowerpot & Mouse, stamped on Whisper White card stock, water-colored the image with SU re-inkers, The flowers and the mouse was stamped on a separate card stock, cut-out raised with stamping dimensional. 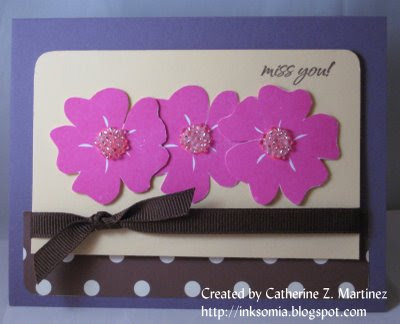 I colored my mini prima flowers to match with stamped flower image. Have you been to Paper Craft Planet? Have you seen Whimsy's First Sketch Challenge? You have until Friday, December 12th to play along and win one of Denise new Whimsy Animal Collection - Owl. You don't have to use one of her animals this time but if you have them, why not use them? Here's Freddy the frog wishing you Happy Holidays! Also, Denise was graciously offer her Whimsy Design Team to offer free stamps to YOU... that's right, more chances to win free stamps, weeks for free Whimsy Stamps!!! (so, make sure to visit the rest of the DT members for the rest of the month). I'm the first lucky DT member to offer it to you and you have the chance to win both Whimsy Skunk and Whimsy Silly Sayings. So, how can you get these free stamps? I'll have you do 2 things to do, first, join us at Paper Craft Planet and make sure to post it on your blog and tell others regarding my blog candy and post your link back here. You'll have until Sunday, December 14th, 6pm EST and Random.Toni (<--my daughter) will be selecting the winner. This was such a fun sketch but I struggle on what to put on that squiggly/swirl line on the right. (<-- LOL! i don't know what it's called) but, I remember that I have this Bird House stamp from Sugar Nellie that hasn't been inked before and that bird house would be perfect for it... well, i think so! Just a simple card for today, after that cutting, I was too exhausted...LOL! And, just a reminder tomorrow, Denise will be releasing 3 new Whimsy Animals Stamps and I'm telling you, you want your hands on these animals. 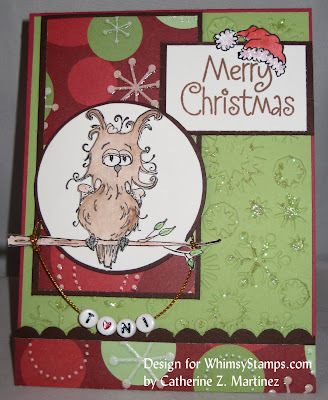 And to get a chance for a free Whimsy Stamps Animal Collection Owl from her new release, visit us at PCP (Paper Craft Planet) for Whimsy's First Sketch Challenge. Still having fun at Dawns a.k.a. FlowerGal36's gallery for this week's Featured Stamper on SCS. So, I thought why not CASE'd another card of hers. Here's the card I CASE'd from her gallery, again I used the same layout as her card but change the main image and the color combination. Main image is Charlie Snowhorse from Clear Dollar Stamps, stamped on Very Vanilla card stock and colored him using Prisma water-color pencils. The ground is covered with crystal effects and drizzle it with Martha Stewart snow glitter. I did the same thing with the punched snowflakes. Ever since, I received my Whimsy Stamps, I've been thinking of ways to use them, they are really so much fun to play with. Denise just emailed us yesterday that the new animals stamps should be out this Friday... can't wait. 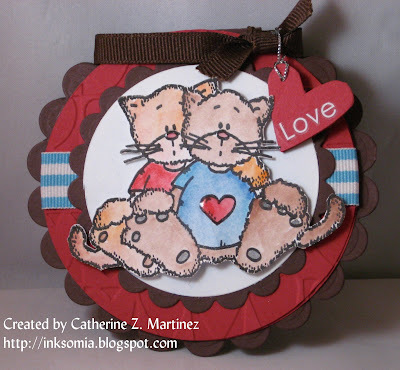 Anyway, make sure to visit Whimsy Stamps blog and please join our group at Paper Craft Planet. This is Dewey's cousin Dimples and you really don't want to know why her name is Dimples...bwahahaha. 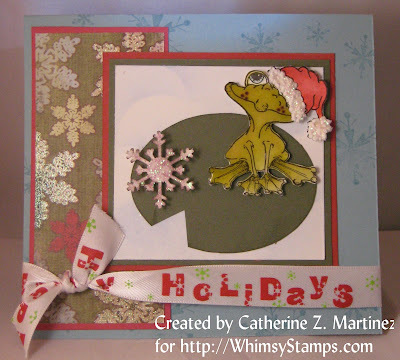 I used the same layout as Dawn's card a.k.a FlowerGal 36 (<---check out her gallery), she's this week's Featured Stamper on SCS. I kept the same layout of the card and change the image and the color combination. 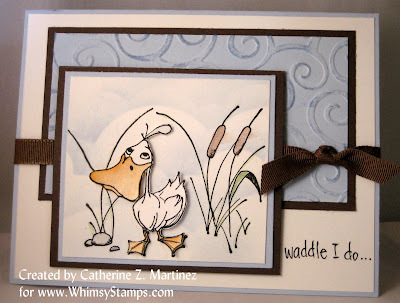 The main image Duck is by Whimsy Stamps was stamped on Whisper White card stock and stamped it again, cut and raised with stamping dimensional and colored with Prisma water-color pencils. I survived the Thanksgiving holiday. I was able to relax, eat, relax and eat some more...LOL! I didn't even sit on my craft table until Sunday. I'm supposed to make an invitation for my sisters in-laws for their house blessing but my printer is not working, I need to make at least 20....eeekks! 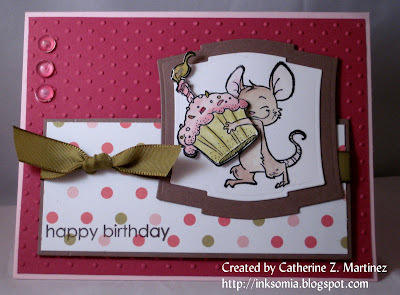 Anyway, here's quick card that I made last night using Taylor's Cupcake Sketch Challenge. I used my new set from Clear Dollar Stamps called Snowman Wishes. The punch snowflakes is by Martha Stewart and it's covered with snow glitter. The patterned paper is by My Mind's Eye Glitter pack.